If you hear the words “The Valley” in Los Angeles, it is really referring to a specific place: The San Fernando Valley. This valley, once mostly rural and agricultural, has developed into a sprawling collection of cities that, while part of Los Angeles, is more suburban in character. Surrounded by mountains, and separated from the rest of Los Angeles by the Hollywood Hills, a great place to see The Valley is from Mulholland Drive, which is where the inspiration for this painting came from. From there, one can see the entire valley, and the Los Angeles basin in the other direction, depending where you are on the road. There is a special quality of light here, and at a certain times everything glows. I was at a park on Mulholland Drive with a friend the night of this sunset, and we both marveled at its beauty. 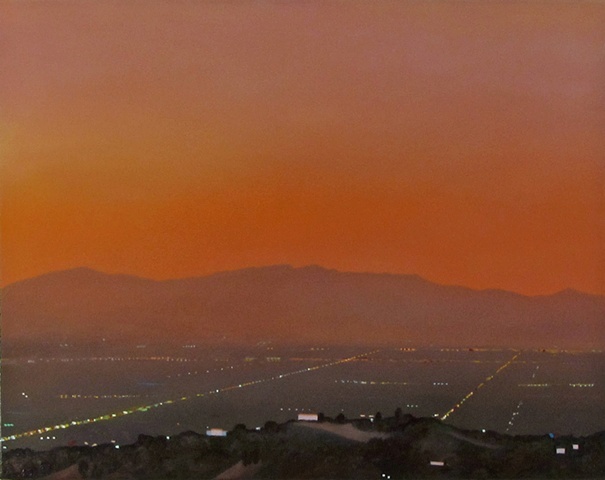 The combination of urban and natural landscapes is stunning, and this is the most recent painting in my exploration of the natural beauty in Los Angeles.